America's No1. 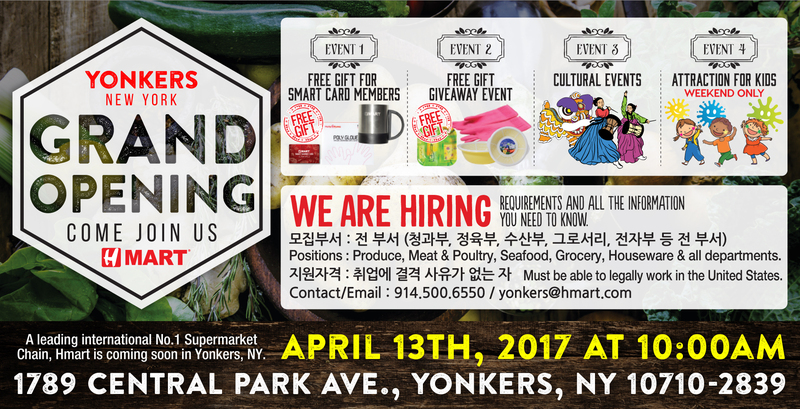 International Supermarket Chain, Hmart officially opens in Yonkers, NY. Hmart brings you delicious seasonal produce, fresh meat, seafood, and wide variety of groceries &housewares. Come experience the New standard in International Supermarkets! H마트 용커스점이 오픈합니다! 맛있는 제철 과일과 싱싱한 채소, 신선한 정육과 수산물 및 다양한 종류의 식료품과 주방용품까지! H마트만의 고품격 쇼핑공간 용커스점으로 여러분을 초대합니다. 美國最大亞洲食品連鎖超市Hmart正式登陸紐約Yonkers社區！雲集亞洲美食，致力提供最優質的新鮮蔬果、海鮮、肉類及各式雜貨和家居用品，打造一站式亞洲超市購物新體驗！ Event 1: Free Gift for Smart Card members / 會員開幕贈好禮 New Smart Card members and current members with valid email address will get valid email address will get a Free mug or Sanitary gloves! 新申請會員卡或更新老卡信息，贈磨砂隨行杯一個或萬用料理手套一盒！ 스마트카드 신규 가입 고객및 이메일 주소를 업데이트 해주신 기존 고객님들께 머그컵 또는 비닐위생장갑을 무료로 증정합니다. Event 2: Free Gift Giveaway Event / 開幕好禮大派送 Get a round basket plate or rubber gloves with purchase over $30. 購物滿30元，可獲得廚房手套或蔬果瀝水籃。 30 불 이상 구매하신 고객분들께 원형 다용도 채반, 맬라닌 쟁반 (그린) 또는 마미손 고무장갑을 사은품으로 드립니다. Event 3: Cultural Events / 精彩文化表演 Don't miss out the special performances of Korean percussion music. Chinese Lion Dance, and many more. 中國舞獅隊助陣，韓國傳統舞蹈秀…千萬不要錯過! H마트 용커스점을 맞이하여 한국 전통 사물놀이, 중국 전통 사자춤, 등의 다양한 문화행사가 펼쳐집니다. Event 4: Attraction for Kids (Weekend Only) / 孩童親子遊戲 (僅開幕周末) Celebrate grand opening with us by participating in face painting and more. 新店開幕周末現場體驗有趣的臉部彩繪，一家大小童心同樂！ 어린이들을 위한 페이스 페인팅 이벤트로 즐거운 추억을 만드세요! Been waiting for the grand opening!!! Yay!! !